NASA’s huge – and very bizarre looking – James Webb Space Telescope is on track to be launched in 2018 after the completion of one of its main components. The primary mirror on the huge telescope, which is “as big as a tennis court and as tall as a four story building”, has now been installed. All 18 segments of the Webb telescope’s primary mirror were installed recently at NASA’s Goddard Space Flight Center in Greenbelt, Maryland. More telescope components will be integrated over the next two years at three other space development locations before the spacecraft is launched from French Guiana. 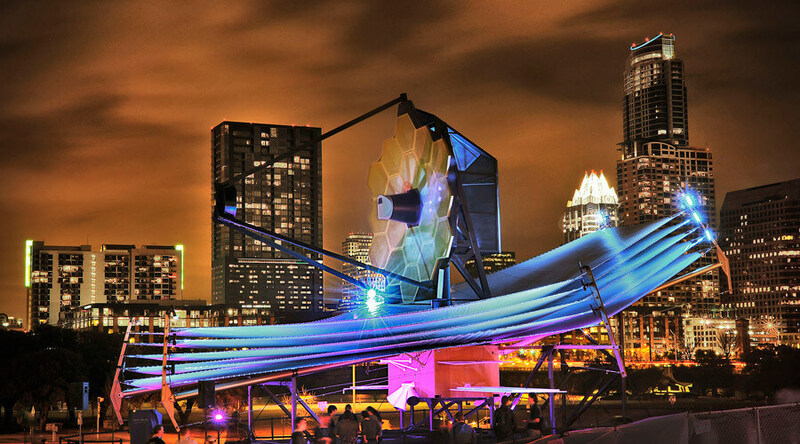 The Webb telescope is designed to facilitate a broad range of investigations in astronomy and cosmology, including observing some of the most distant objects in the universe which lie beyond the reach of current ground and space based instruments. The Webb Telescope is shaping up to succeed NASA’s Hubble Telescope, launched in 1990, as the most powerful space telescope ever built. The two largest components are the primary mirror and the tennis-court-sized sunshield. Four flight science instruments, including cameras and spectrographs with detectors to record extremely faint signals, will also travel aboard the spacecraft. All four instruments were built into the Integrated Science Instrument Module (ISIM) in March 2014 and have been undergoing multiple tests, but have not yet been added to the observatory. It’s also hoped it will further scientists’ understanding of the formation of stars and planets. Once the flight and deployment testing is finished the complete observatory will be shipped to South America for its expected launch in October 2018.